The Maya Sacred Calendar is based on their 260 Day ritual Calendar. Events change yearly. Contact us for specific days. 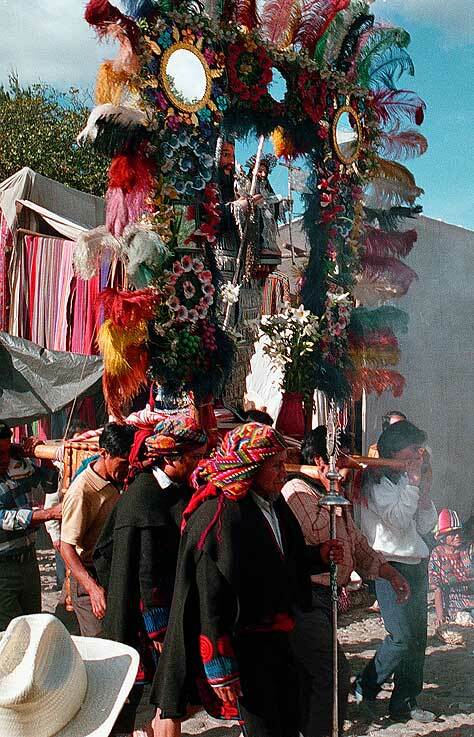 Semana Santa, or Easter week in Guatemala is one of the most colorful times to visit the country and to admire the religious and Indian folkloric traditions on display in different regions of Guatemala. The best place to be during Holy Week is La Antigua Guatemala. National Folkloric Festival of the "Rabin Auhau" and election of the Indian Princess Tesulutan in Coban, Alta Verapaz. All Saints Day in Huehuetenango, and Santiago Sacatepequez. November 1st is one of the most important days of the year in Guatemala. On this day we celebrate the Day of the Dead. It is a celebration in which cemeteries are visited and decorated in memory of loved ones. It is a union of ancient pagan beliefs and of the Catholic traditions brought over by the Spaniards in the XVI and XVII centuries. On this day two major celebrations take place "the horse races in Todos Santos, Huehuetenango," and the flying of giant kites in Santiago Sacatepéquez. The village of Santiago Sacatepéquez is of Cakchiquel origin, and is located 30 Km from La Antigua Guatemala. From the early morning hours, the people in this village gather in the narrow streets and begin their procession to the local cemetery. Once there, they take part in one of the most colorful traditions of Guatemala, flying giant kites to communicate with their loved ones who have passed away. The celebration takes place in the local cemetery, and it ends with a sumptuous lunch and a traditional dish called "fiambre." The giant kites are around 2 meters in diameter, and have small messages tied to their tails in which the villagers let their dead know how they are doing and ask God for special favors.